Due to inclement weather, I opted to work in the studio. I worked with reference photos from trips to Door County. None of the photos gave me an uncluttered view. Each photo of this old structure had elements which obstructed the view I wanted. But I was able to utilize portions from several photos to create the neater version pictured above. Enjoyed that exercise enough that I decided to repaint the design in watercolor as pictured below. To help my watercolor students understand the idea of building their paintings, I occasionally create these “step-paintings”. Most students can visualize how they want their finished painting to look but often end up with rather mechanical and stiff paintings which often lack harmony and a sense of playfulness. The first, or Outline stage (top illustration) is created in a technique which I refer to as “splash”. This is a manner of loosely applying colors in way that allows the colors to flow into each other. Although all of the major elements are clearly sketched out before painting begins, all lines become suggestions and not barriers. That is, I allow the yellows and oranges from the tree foliage to flow into the green grass, if it wants to. This latitude allows for interesting opportunities and will aid in adding harmony to the painting. 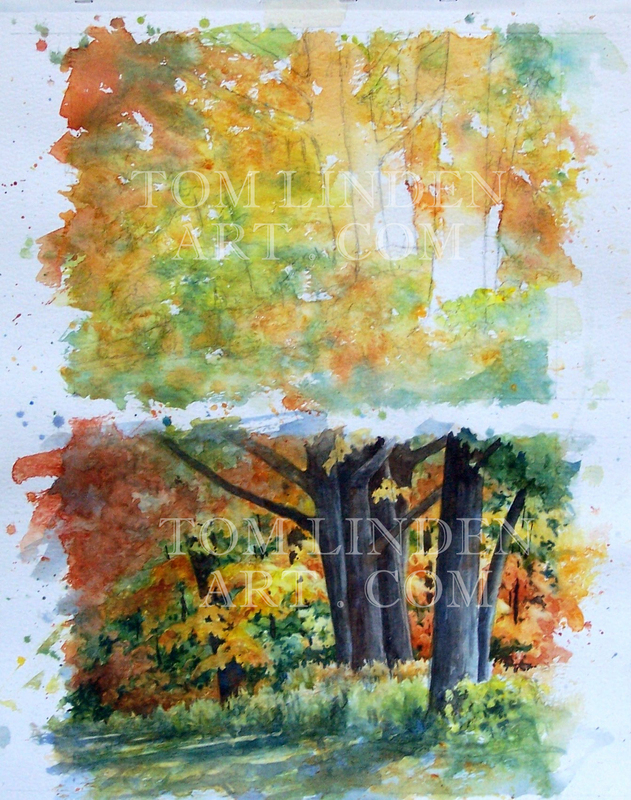 After the “Outline” stage has an opportunity to dry, I proceed to the “Refine” and “Define ” stages to complete the painting as seen at the bottom of the watercolor paper.